Chou Chun-Hsun 9p is a player that Chinese Taipei deserve to be proud of. Chou not only won the LG Cup in 2007, but is also one of their finest homegrown players in history. While many top players such as Chou U move to Japan or China to study, Chou Chun-Hsun is still at home and is now training the next generation of young hopefuls. Known as the ‘Red-Faced King’, Chou was inspired to aim for the top by Mikhael Gorbachev, who shares a similar red birthmark, and now stands as the King of Go in Chinese Taipei. Ranka: How was your game this afternoon with Japan’s Fujita 4p? Chou: I was content with my position from the beginning until my opponent played an unusual knight’s move, which caused some problems. In the end I lost by resignation. The young Fujita was a very strong opponent. Even though he lost to his Chinese and Korean opponents, I felt that he had a number of chances in those games. Ranka: How did you start playing go? Do you play other sports? Chou: My father, a 3 dan amateur, got me into the game when I was seven. In my free time I enjoying running and mountain climbing. I think it’s important to maintain good physical fitness for playing go at a professional level – the time limits are long and it’s important to have the strength to keep full concentration. Ranka: Tell us about the Haifeng Weiqi Academy. Chou: This is our top academy for training young children, and we currently have nine students. The academy is named after the great player Lin Haifeng (Rin Kaiho in Japanese), whose daughter married the son of the academy’s founder Lin Wenbo. 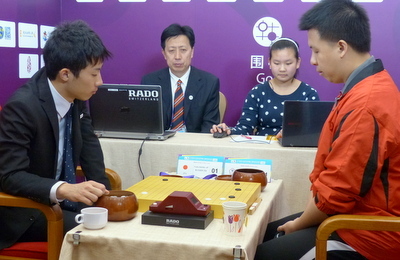 Lin himself is a very strong amateur player (7 dan) and has acted as a sponsor, giving free tuition to the youngsters. I’m now the main instructor. Ranka: Do you enjoy teaching go? Chou: Actually I used to find it a bit of a chore, but now I see it as an important responsibility. There are so many strong young Koreans and Chinese that we need to create similar programs to train the next generation of players for Chinese Taipei. We are still a long way off and need to focus more on nurturing young potential.